Our Thanksgiving Turkey Leftovers Recipes offer a wonderful way to make healthy, tasty homemade dog treats. Thanksgiving is rolling around, so why not check out some of these Thanksgiving Turkey Leftovers Recipes and bake up some LOVE for your dog! Thanksgiving is a time where we get together with the people we love and give thanks for all our blessings, including our four legged family. . . our dogs. They are faithful, loving and always there for you no matter what is going on in life, good, bad or sad. Tail wagging, cold noses and sloppy kisses are just a few of the silly wonderful ways our dogs show their love for us. 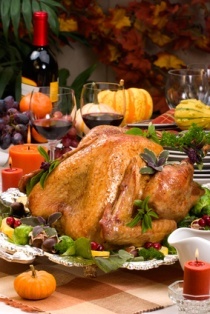 It's a great time to share those Thanksgiving Turkey Recipes with family and friends. And don't forget to share an easy Thanksgiving Turkey recipe for a yummy Holiday dog treat! Who knows, other than human guests, you might also have a few four legged friends over too. As family and friends begin to arrive in your cozy, great smelling home, don't forget to take time out and have a little fun with your favorite dog outside. Before all the feasting begins how about take your dog outside for a fun time of catching a ball or Frisbee. Or maybe you have a huge pile of autumn colored leaves on the ground just waiting to be jumped into by you and your dog. Whatever it is, being outside with your dog is always fun and very rewarding to both of you. After all the stuffing, Thanksgiving Turkey, side dishes and Pie, why not encourage some people to get together and take your dog and theirs out for a leisurely walk around the neighborhood. . . helps burn off some calories ya know. will just hit the spot for him! Enjoy a happy Thanksgiving with your dog. Blessings to you, your family and beloved pet! Do You Have A Recipe You Would Like To Share? Why Not E-Mail It!